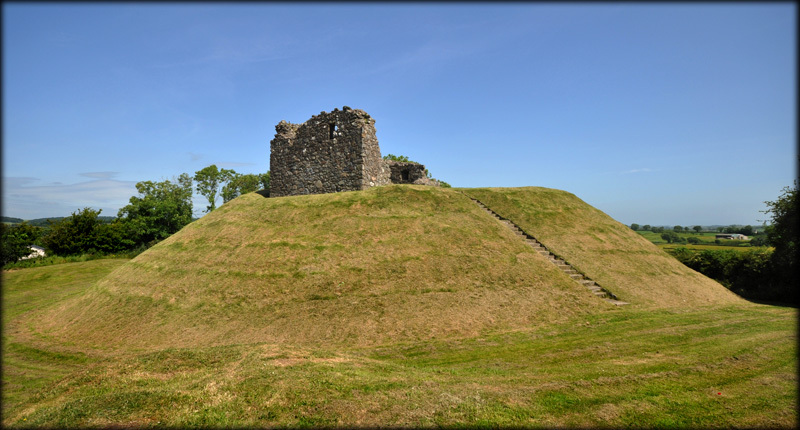 This fine example of a Norman motte and bailey was built at the end of the 12th century. 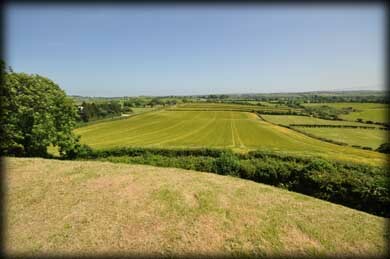 These artificial mounds were built during the norman invasion as they were quick to build and easy to defend. Excavations in the 1950s show that there was a wooden palisade around the top of the flat topped motte with a pit for archers inside the stockade. The steep eastern side of the motte is at least 7 metres high. In the 13th century a large timber hall was built on the eastern side of the summit and later that century a stone tower was built on the west side, part of which still remains. 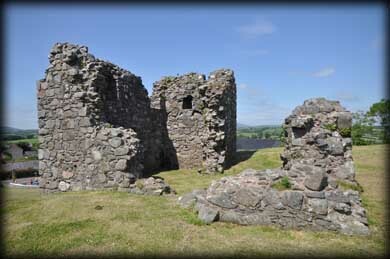 The tower was extended in the 15th century to form a tower house. The lower mound to the right in the image above is the bailey. They usually contained the domestic building and may have housed the troops. The bailey is separated from the motte by a 6 metre wide by 2 metre deep ditch. Originally there may have been a wooden bridge connecting the motte to the bailey. 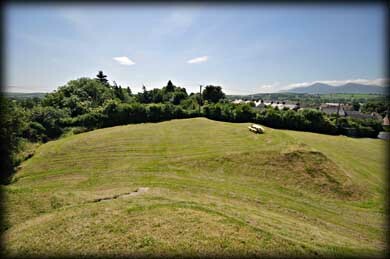 The motte and bailey castle was built to defend one of the entrances to the Lecale Barony. The views from the summit are superb. Situated: From Newry head northeast on the A25 towards Castlewellan. Keep on this road till you reach Clough. As you enter the town turn left. Clough Castle is just before the roundabout on your left. Discoverer OS Map 29: J 4084 4033. Last visit July 2013.